We ship 3 to 5 business days from when your order was placed (unless you special-order an item, in which case it may take a bit longer), via Priority Mail from the U.S Postal Service. Orders will usually arrive within 3 to 6 business days from the date they were shipped. Holiday orders may take longer due to increased post office activity. We do not ship on weekends. Sales tax is added to all orders within the state of Florida. We do not automatically provide tracking info. Please request your tracking # if desired. We may sometimes be sold out of an item because of in-person (non-website) sales at fundraising events, adoption fairs, etc. If you have placed an order for a sold out item, we will notify you via email. EXCHANGES: Any inquiries about exchanging shirts MUST be made within 7 DAYS of receiving your order. We will NOT exchange any shirts that are worn, washed, damaged, smell of cigarette smoke or any other odor, or kept for over 7 days after receiving your order. We are NOT responsible for normal wear and tear. Buyer is responsible for ALL shipping charges. *NOTE: You MUST contact us prior to sending back ANY item for an exchange, for approval. If you wish to exchange your shirt for another size or style, please contact us, and explain what you wish to exchange your shirt for, and the reason. ALL SHIPPING FEES, including our shipping cost to send you the new shirt, must be paid by you, the buyer. If you are paying your shipping fee via check, please make check out to Tommy Pop Art, LLC. *PLEASE NOTE — WE DO NOT OFFER REFUNDS. Once a shirt is purchased, a donation is automatically generated from your purchase, therefore, we cannot offer cash refunds on any purchase. We gladly offer item exchanges (please see terms on "Exchanges" above). NOTE: WE CANNOT BE RESPONSIBLE FOR LOST OR STOLEN PACKAGES ONCE THEY ARE SHIPPED AND CONFIRMED THAT THEY HAVE BEEN DELIVERED. We do NOT refund original shipping fees on exchanges. We are NOT responsible for lost return packages. Note: All of our shirts are screen printed in small batches, so every shirt might be slighty different in design placement and color. How should I care for my shirts? For ideal care and maintenance of your shirt, machine wash cold, with design turned inside-out. Tumble dry on delicate or warm (NOT on hot or high heat). You can also lay flat to air-dry (no drier). Orders are shipped via Priority Mail from the U.S Postal Service. Within the U.S., orders usually arrive within 3 to 5 business days. You may EXCHANGE an item, however, WE DO NOT OFFER REFUNDS. Please see our SHIPPING AND EXCHANGES section. Can you make a shirt design for my charity or organization? Tommy (the artist) is always willing to discuss personalized designs, and will offer discounts to non-profits. Contact us and he will get in touch with you. Please note that his timeframe for creating custom designs is approx 4 to 6 weeks. How can we sell your shirts in our store? Contact us and we will get in touch asap to discuss our wholesale details. 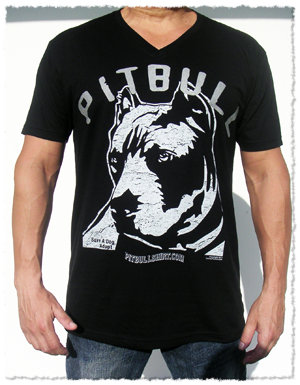 How do I contact Pitbull Shirt? How can my non-profit charity/rescue organization become eligible to become your donation recipient of the month? Contact us, and let us know a little about your organization [must be 501(c)3], and also include the link to your Facebook page(s). 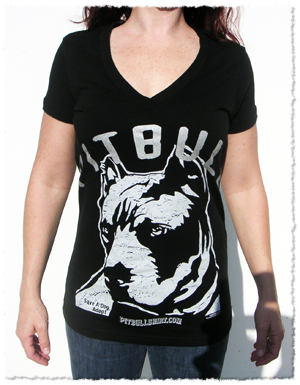 We have gift certificates available for our PItbull Shirts and for Tommy Pop Art pet portraits. We have $25, $50 and $100 denominations. Or we can customize a personalized one for any denomination. Just contact us!